While the S.G.C. investigates a seemingly unstoppable new enemy soldier engineered by Anubis, Daniel leads a team in search of an alien device in Central America. Teal’c and Bra’tac arrive through the Stargate on an alien world to find the seared remains of a recent battle. Jaffa bodies lay dead, strewn across the landscape. Here a pair of minor Goa’uld lords, Ramius and Tilgath, were to meet. The two find Ramius’s First Prime alive, and he explains the disaster: an unknown warrior in black armor suddenly appeared and destroyed them all. The dozens of Jaffa were no match for the single warrior; Tilgath is dead, and Ramius barely escaped alive. But before he can tell them any more, the Jaffa is suddenly shot dead. Teal’c and Bra’tac turn to see the warrior standing on the hillside, and quickly take cover as he rapidly fires an energy weapon attached to his wrist. They shoot back with their staff weapons, and with a zat’ni’katel, and even go hand-to-hand. The warrior’s armor absorbs the energy of the weapons, and nothing can stop it. As it approaches Teal’c to finish him off, Teal’c continues firing his zat gun over and over at the creature. It finally slows, collapses, and dies. They bring the warrior’s body back to the S.G.C., where Major Samantha Carter and her father, the Tok’ra operative Jacob Carter, analyze the creature. They remove its armor to find a strange creature behind the mask — a slimy, skeleton-like face, with hollow-looking eyes. It is far from human. 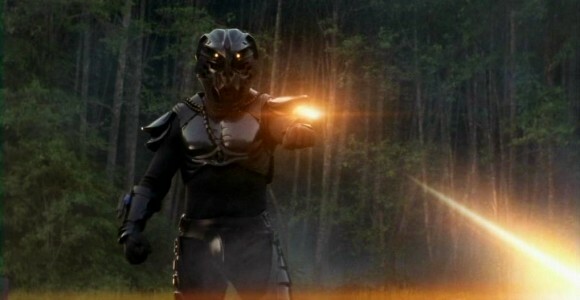 Based on their analysis Sam and Jacob conclude that the armor is completely impervious to energy-based weapons, and that the creature inside is a genetically engineered being possessed by a Goa’uld symbiote. It has likely been bred to replace the Jaffa as foot soldiers, and to be a regenerative and virtually unstoppable killing machine — but with one flaw. Its cloned body doesn’t have a very long lifespan. In fact, they conclude that this particular warrior died of a serious, pre-existing pulmonary condition, and not Teal’c’s repeated zat blasts. He and Bra’tac just got lucky. Jacob tells the team that the technology used to create such a creature is a very old device created by the Ancients and discovered by the Goa’uld thousands of years ago. The Goa’uld Telchak used the device to develop the first sarcophagus, which can heal wounds and even raise the dead. Anubis sought the powerful device (before he ascended), and went to war with Telchak — but never managed to find it. But after he joined the Ancients on a higher plane of existence, Daniel concludes, he wouldn’t need it — he would have learned how to build his own. Dr. Jackson is reminded of the work of his grandfather, Nicholas Ballard (“Crystal Skull”). Ballard came to believe that the source of the Fountain of Youth myth was a piece of alien technology, which he traced to the Mayan god Chac — who Daniel guesses may have been Telchak. Jacob recognizes some of the writing in Ballard’s notes as an ancient Goa’uld dialect, which indicates that the device may be hidden in one of Telchak’s temples on Earth. With his grandfather’s research and Dr. Lee in tow, Jackson sets out to find the lost device in Central America — specifically, Honduras. Bra’tac, Jacob and the rest of SG-1 conclude that Anubis is engineering these “super-soldiers” and sending them after minor Goa’uld, as part of a plan to quickly absorb their forces into his own in preparation for an all-out war with Baal and the other System Lords. To thwart Anubis’s plan to become a dominant power in the galaxy, SG-1 and Bra’tac set out to save Ramius from another attack — and, if all goes according to plan, capture the next super-soldier alive in order to interrogate it. A fine-tipped trinium dart, Sam believes, should be able to penetrate the warrior’s armor and tranquilize the creature. In Honduras, Jackson and Lee hire a local guide to lead them into the jungle and help them locate Telchak’s temple. They soon find a hidden entrance, and the two scientists make their way down a cramped, underground corridor while the guide waits outside. They come to a dead-end, but Daniel remembers the legend of the Fountain of Youth: “All waters flow towards it.” Dumping out a canteen, he follows the trail of water to a stone in the center of the room, which they lift up to reveal the lost artifact. Lee and Jackson carefully remove the large, cubed device, but trigger a booby trap. The entire underground network rapidly fills with water, and the two barely make it out alive. Climbing out and back to the surface, they are met with guns pointed at them. A local band of guerrillas take Jackson, Lee, and their guide hostage. When the guide, blindfolded, later tries to run away, he is shot dead. When they arrive at the guerrilla encampment, the prisoners are thrown into a small, dirt-floor hut. They will receive food and water only as much as they cooperate. The men intend to hold them for ransom from the U.S. government. And one survivor is enough for their purposes. SG-1, SG-3, Bra’tac and a group of sympathetic Jaffa lay a trap for the super-soldier near the Stargate on Ramius’s planet. They will be safe for a while on the Goa’uld-occupied world, thanks to help from members of the Jaffa Resistance who still serve in Ramius’s army. The super-soldier arrives, but the tranquilizer dart fails to even slow it down. Under fire from the Jaffa and S.G.C. personnel, it easy escapes a Tok’ra forcefield and walks slowly toward Ramius’s palace. The team is soon captured by Ramius’s loyal Jaffa, and thrown into a prison cell in his palace. They try to convince Ramius and his Jaffa that they came to help him, to stop the super-soldier — but they pay the warnings no attention. When the warrior arrives and begins decimating Ramius’s guards, the Jaffa Resistance members arrive to free the team. Ramius may be done for, but Major Carter believes there is still a way to capture the soldier: they steal a cargo ship and fly over the warrior’s dead, transporting him up with the ship’s rings. Even after turning off life support to the cargo hold, it takes 10 minutes for it to lose consciousness. They bring it back to the S.G.C. for interrogation. The creature is unwilling to tell them anything, but by using the Tok’ra memory recall device they are able to read its conscious thoughts. They ask what planet it is from, and it thinks of the stars visible from where it was created; the Tok’ra can use the constellations to get a fix on the planet where Anubis may be creating the super-soldiers. The celebration, however, is brief. General Hammond arrives to inform the team that Dr. Jackson and Dr. Lee have been kidnapped, and their location is unknown. “The first part of our mid-season two-parter (hey, remember the days when the 11th episode was the midway point of the season?) introduced a fearsome new enemy with an equally fearsome codpiece. Yep. Whenever the deadly super soldier strode onto the scene, all I could think was ‘I wonder if that’s where they keep it’s battery pack?’ The idea of an almost indestructible enemy was a good one and, on paper, it certainly sounded cool — but the finished product was more likely to trigger laughter than any feelings of foreboding. VOTE! How would you rate SG-1's "Evolution, Part 1?"